TRIUMF is committed to safety. The TRIUMF tour route is designed to be safe for adult members of the general public and does not require any personal protective equipment. That said, as TRIUMF is a working physics laboratory, there are some safety considerations to be aware of when on site. In this document, we have outlined some important safety information every guest must review before visiting the laboratory. To protect personnel and guests moving through the TRIUMF site, closed toe shoes with a low heel are required footwear on the tour route and in non-office areas within the TRIUMF perimeter fence. These areas contain potential hazards such as equipment and objects with sharp corners, material from construction work, as well as metal stairs that necessitate appropriate footwear. As the tour route involves walking over grated floors and stairs, it is highly recommended that guests wear long pants. Large bags/knapsacks are not permitted on the tour route. As TRIUMF does not have locker or storage space for guests’ items, we ask that guests not bring large bags/knapsacks with them to TRIUMF. There are absolutely no food or drinks (including water) allowed on the tour. We recommend that you eat something prior to the tour so that you feel fully energised when walking around the facility. You are more than welcome to grab a bite at TRIUMF's cafeteria afterwards. Cameras are welcome (both still and video). Avoid bringing any large equipment with you, since the tour group will be constantly moving around the facility. Prior to visiting TRIUMF, all prospective guests with an implanted medical device should visit their doctor to obtain documentation on the magnetic and electric field sensitivity of their device. If in doubt, guests with any type of implanted medical device should notify their TRIUMF host prior to or immediately upon arrival at the laboratory and avoid tour areas with measured magnetic fields above background levels. NOTE: Intrauterine devices (IUDs) and large medical implants such as hip replacements will not be affected by the magnetic fields on the TRIUMF tour route, nor will credit cards or any consumer electronic equipment. Safety regulations require that we keep track of everyone who enters the TRIUMF site. Upon arriving at the laboratory, please sign in at main reception or any other registration area, as instructed by your TRIUMF host. If you are with a group, please arrive prepared with a list of all group members joining the tour. All guests with implanted medical devices who have not yet notified their TRIUMF host must alert them upon arrival. If available, guests with implanted medical devices are asked to provide documentation on their device’s sensitivity to external electric and magnetic fields. While waiting for your tour to start, please be considerate of the TRIUMF staff working in the surrounding area. To support staff in continuing their work uninterrupted, we ask guests not to wander and to help keep the noise level to a minimum. Be sure to use washrooms before the start of the tour. If guests need to use the washroom facilities while on the tour route, they must ask their guide to stop. Guests may not leave their group for any reason. REMAIN WITH YOUR GUIDE. At all times throughout the duration of the tour, guests must stay together with their TRIUMF guide. Guests having had a nuclear medicine scan within the last week should inform their tour guide, as they are likely to set off the portal monitor when entering or leaving the site. Guests must ensure that each child under 12 years of age remains under the close supervision of a responsible adult. Large groups of children (such as school classes) with few adult supervisors are limited to children aged 12+ years. For each tour group with children under the age of 12, there must be a minimum of one adult supervisor present (in addition to the TRIUMF tour guide). Please note: TRIUMF reserves the right to restrict participation on tours. Established in 1968 in Vancouver, TRIUMF is Canada’s particle accelerator centre. The lab is a hub for discovery and innovation inspired by a half-century of ingenuity in answering nature's most challenging questions. From the hunt for the smallest particles in our universe to research that advances the next generation of batteries or develops isotopes to diagnose and treat disease, TRIUMF drives more than scientific discovery. Powered by its complement of top talent and advanced accelerator infrastructure, TRIUMF is pushing the frontiers in isotope science and innovation, as well as technologies to address fundamental and applied problems in particle and nuclear physics, and the materials and life sciences. In collaboration with 20 Canadian universities, TRIUMF's diverse community of nearly 600 multidisciplinary researchers, engineers, technicians, tradespeople, staff, and students create a unique incubator for Canadian excellence, as well as a portal to premier global collaborations. Our passion for understanding everything from the nature of the nucleus to the creation of the cosmos sparks imagination, inspiration, improved health, economic opportunity, and a better world for all. 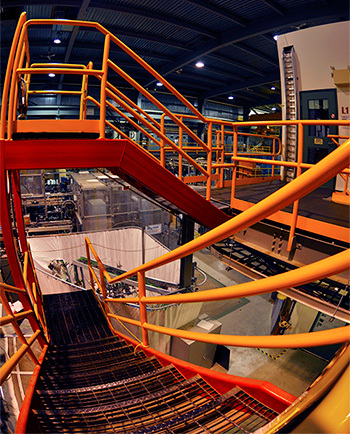 Connect with TRIUMF on Twitter, Facebook, and Instagram: @TRIUMFLab.